Development in the banking sector, the cheque has become one of the favorite Negotiable Instruments. When cheques were issued as a Negotiable Instruments, there was always the possibility of the same being issued without sufficient amount in the account. Bouncing of cheque or non-payment of the cheque is a serious offense in India, you can have imprisonment or fine as per rules under Section 138 of the Negotiable Instruments Act. When the cheque bounce, a cheque recipient must give a notice to the cheque issuer informing about cheque bounce under section 138 within 30 days to save guard his/her rights under Section 138 of the Negotiable Instruments Act. Cheque bounce notice is a legal intimation to the cheque issuer that the cheque recipient will further take a legal action if payment for the cheque is not made without a delay. The cheque bounce notice should be valid and should contain all the details with reference to Section 138 of the Negotiable Instruments Act, details about when the cheque was deposited, the reason for non-payment i.e. is returned unpaid for insufficiency of funds or for the reason that the amount exceeds the arrangement made with the bank and a request to the cheque issuer to arrange for payment right away through alternate means. It must also contain any evidence as you may have regarding the stated grievance. It must be signed by you and your lawyer. The notice must be in writing informing that cheque is returned unpaid also a demand of cheque amount must be made and it should be within 30 days from receipt of information of dishonor. Cheque bounce notice or Section 138 notice is created; it can be printed on a plain white paper or letterhead of the business and posted to the cheque issuer. The cheque bounce notice must contain the name of the cheque recipient, name and address of the check issuer, date of cheque bounce, and the reason for dishonor of cheque. Also, request them to do the payment in another alternative way. It’s important to send the notice through the registered post so that the date of issuing can be recorded for the further legal process. One copy of the letter can be retained by the cheque’s beneficiary while the other copy is delivered to the cheque issuer through registered post. The payee or the holder in due course of the cheque as the case may be, makes a demand for the payment of the said amount of money by giving a notice, in writing, to the drawer of the cheque, within thirty days of the receipt of information by him from the bank regarding the return of the cheque as unpaid. The cheque must have been drawn for the discharge of existing debt or liability. The cheque should have been presented within a period of 6 months of its validity. The cheque must have been returned by the bank due to it exceeds the amount arranged or insufficient funds. 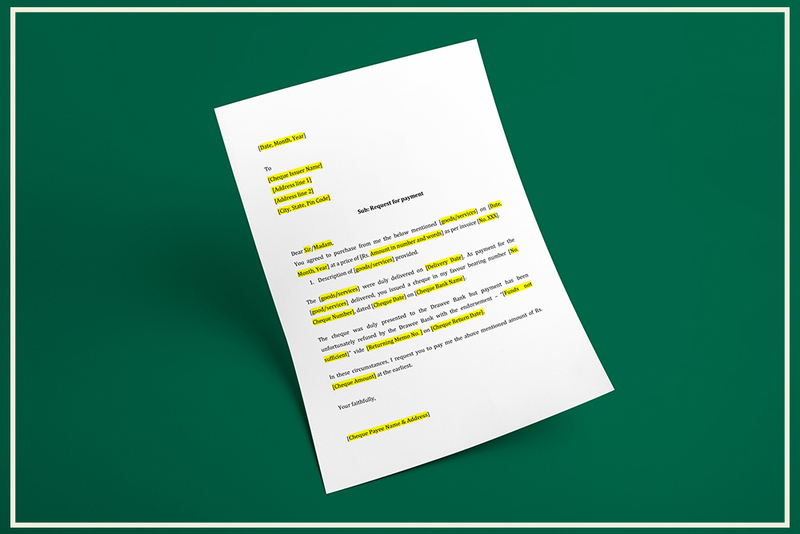 If the recipient makes a demand for the amount by giving a notice in writing, within the specified time of 30 days of the receipt of information by him from the bank that funds are insufficient. Within one month of the date on which the cause-of-action took place, legal action can be initiated. Cheque dishonor notice must be issued by the payee to the defaulter by registered post (or Speed Post) acknowledgment due, within 30 days of dishonor of cheque. The notice should be in proper format as per rules, with information like type of transaction, amount to be paid, when the cheque is deposited (the valid date), date of cheque retuned intimated by the bank, the reason for cheque bounce and demand to make payment of required amount within a stipulated time period of 15 days with other media. If the cheque defaulter fails to make the required payment within a stipulated time period of 15 days of cheque bounce notice, the payee should file a criminal case in an Indian court within 30 days. Cheque bounce complaints must be filed in a court in the city of India where the cheque was presented. Once the case is filed in the court, after the hearing of the case and summons will be issued by the court under Section 138 of the Negotiable Instruments Act. The cheque defaulter should appear before the Court along with the security for resolution of the matter. Dishonor of cheque for insufficiency, etc., of funds in the account. The drawer of such cheque neglects to make the installment of the said measure of cash to the payee or, by and large, to the holder at the appropriate time of the cheque, inside fifteen days of the period given after the notice. Explanation: For the purposes of Section 138 of the Negotiable Instruments Act, “debt or other liability” means a legally enforceable debt or other liability. For Companies 242 Offences by companies. In the event that the individual submitting an offense under section 138 is an organization, each individual who, at the time the offense was conferred, was accountable for, and was responsible to, the organization for the lead of the matter of the organization, and also the organization, will be regarded to be liable of the offense and will be obligated to be continued against and punished appropriately: Provided that nothing contained in this sub-segment will render any individual at risk to discipline on the off chance that he demonstrates that the offense was submitted without his insight, or that he had practiced all due perseverance to keep the commission of such offence. Where any offense under this Act has been committed by an organization and it is demonstrated that the offense has been conferred with the assent or conspiracy of, or is owing to, and disregard with respect to, any director, administrator, secretary or another officer of the organization, such as executive, supervisor, secretary or different officers will likewise be considered to be blameworthy of that offense and will be subject to be continued against and punished in like manner.